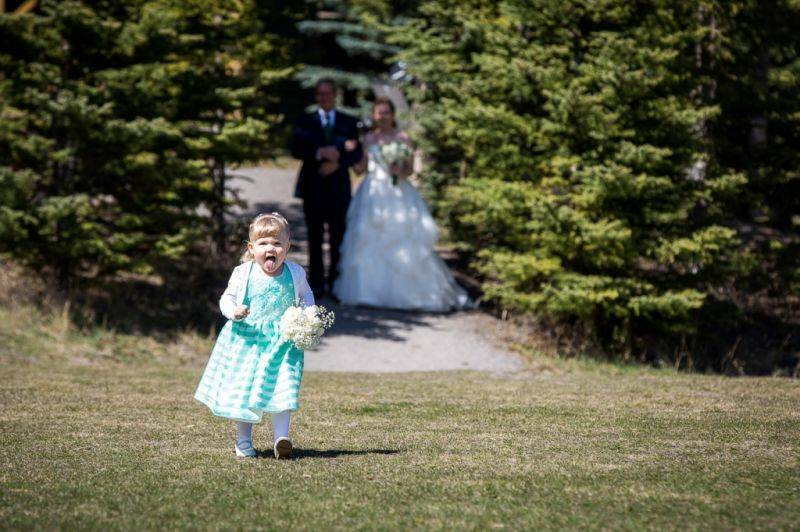 "The week before Scott proposed we were spending Family day with my brother, sister-in-law and niece in Lake Louise. That night Scott pulled my brother aside and said "now is the time, I'm going to marry your sister". He then promptly spent the next five days planning as we were flying to Whistler for a ski vacation at the end of the week. He drove out to my parents place to get permission from my Dad, shopped all week until he found the perfect ring and all this time I had no clue! Whistler was an incredible vacation even though the snow was not very good that year and on the third day I opted to work on a paper for school in the morning rather than ski but promised I'd come out for the afternoon. It's a good thing I did because it was the clearest day and you could see for miles and miles. Scott brought me to the top of Whistler Mountain and said we should take some pictures by the inukshuk with the black tusk in the background. After taking a few selfies he turned to me, pulled the ring out of his pocket and asked me to spend the rest of my life with him. Of course I said yes and we skied off in pure joy and bliss. He later explained that he knew this was "the spot" on our first day of vacation as we had given his sister in England a Jade Inukshuk for her wedding and my brother a painting of the Black Tusk from the exact viewpoint on top of Whistler for his wedding." 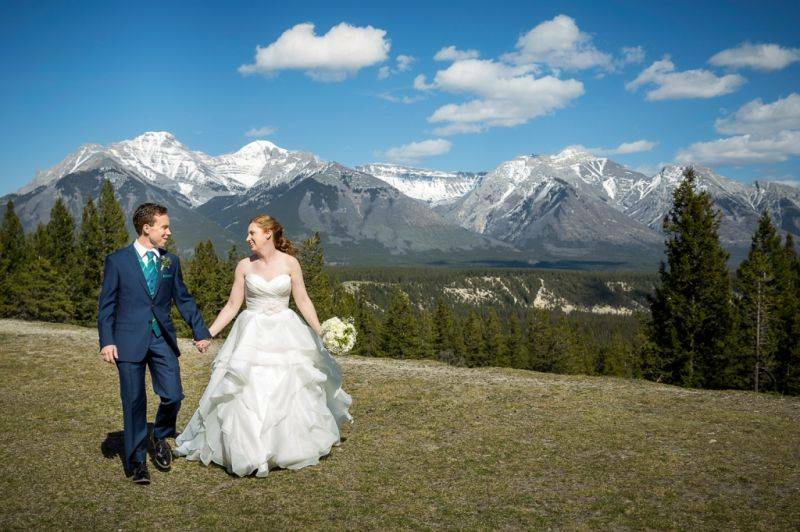 With a love of the mountains running deep between the two of them, they easily decided on getting married in Banff and both agreed on having a smaller wedding with only close family and friends as they wanted an intimate atmosphere. In the end, they had know most of their guests for at least 20 years and they all held a special place in their lives. 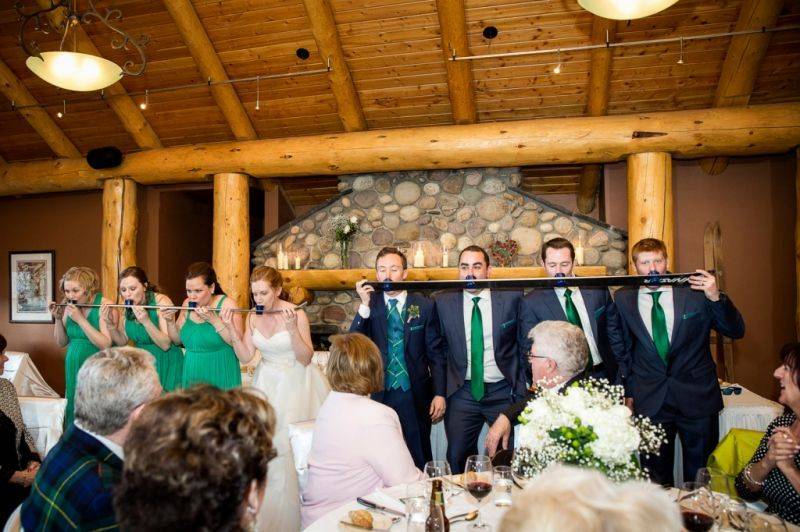 Claire and Scott were both happy they agreed to a small wedding as they held an open mic session in order to get them to kiss and it brought out so many beautiful stories, memories, laughs and tears - creating a very special part of their wedding day. Scott wanted to wear his Hamilton family Scottish tartan for the wedding so they ordered fabric from Scotland and had his vest custom made. Claire knew she would take his last name and as a symbol she wrapped her bouquet in his tartan as well. 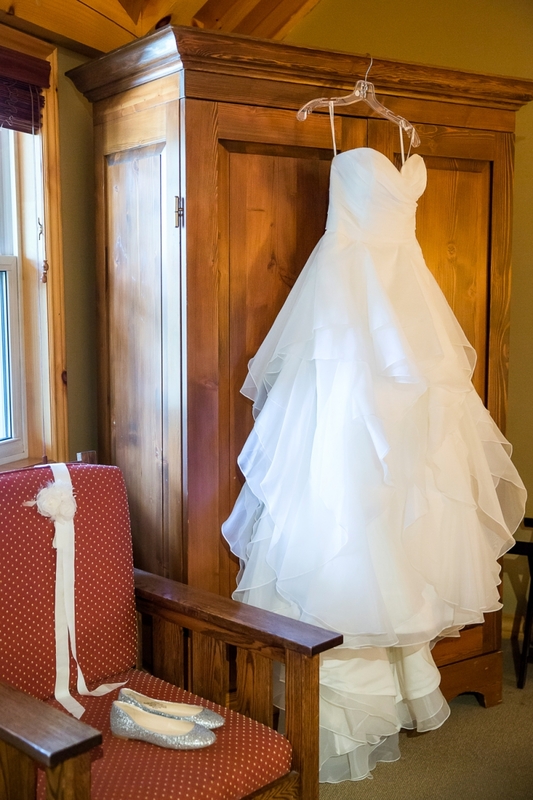 The beautiful soft green and blue was the perfect accent to their wedding colors and theme. 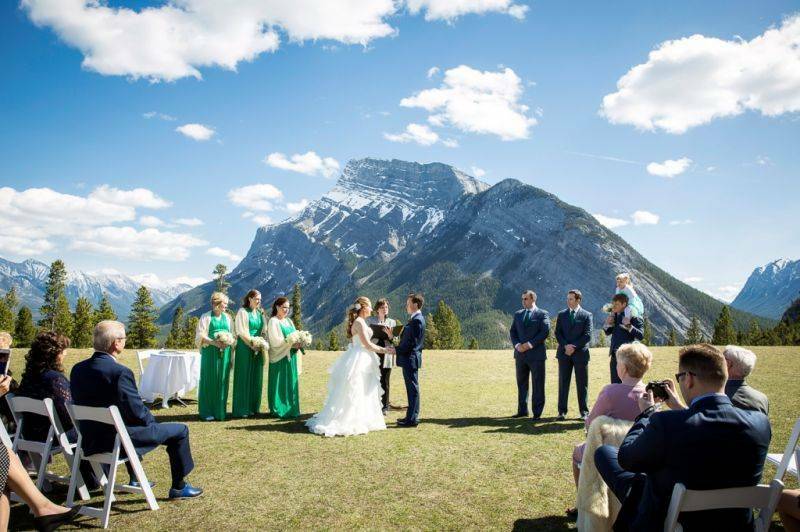 The Banff wedding ceremony was held at Tunnel Mountain Reservoir overlooking the beautiful Rundle mountain. 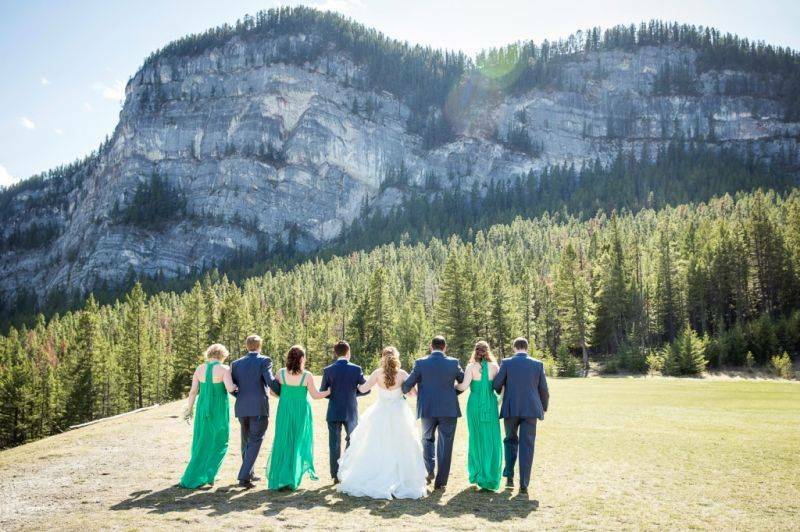 Their Banff wedding photographer, Kim Payant Photography helped capture all of the beauty of this gorgeous Spring day along with the special intimate moments and memories between them. 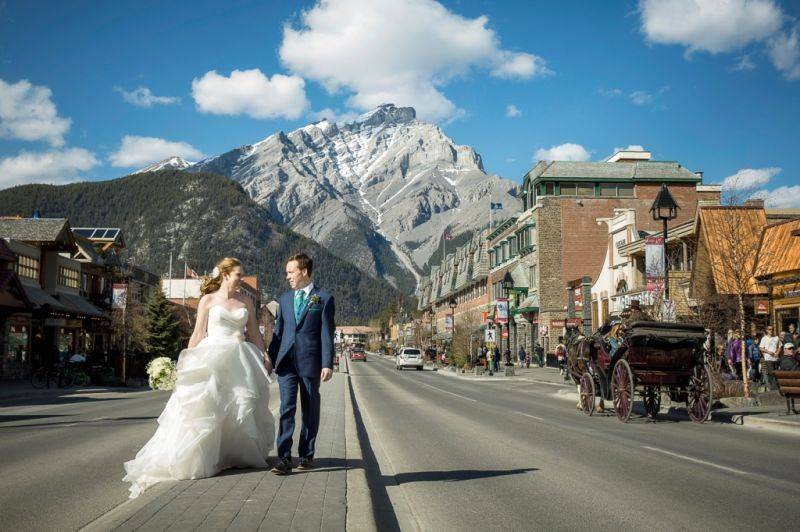 Claire and Scott trusted their Banff wedding photographer, Kim Payant, to figure out all of the photo locations as they knew she had the best understanding of the area but they did request the iconic Banff Ave. shot with Cascade mountain and all of the shops in the background. 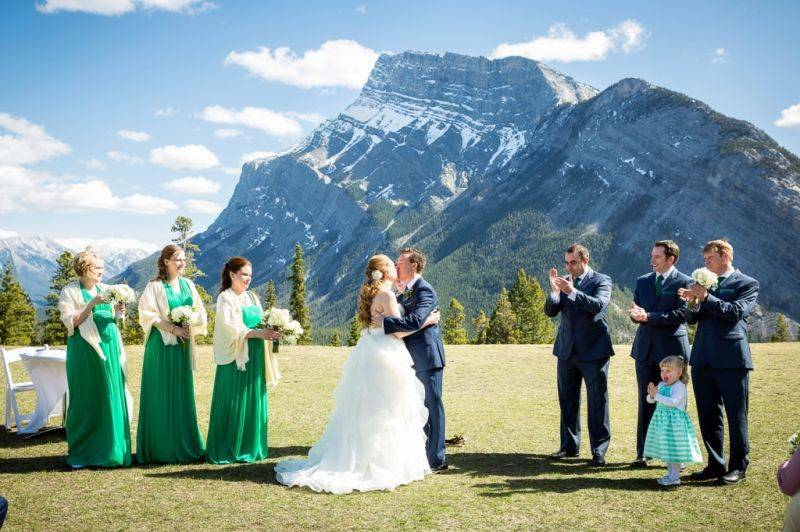 She delivered exactly what they were looking for and now they'll always have that classic shot of Banff to show their kids and grandkids and a big smile as they remember this amazing day. 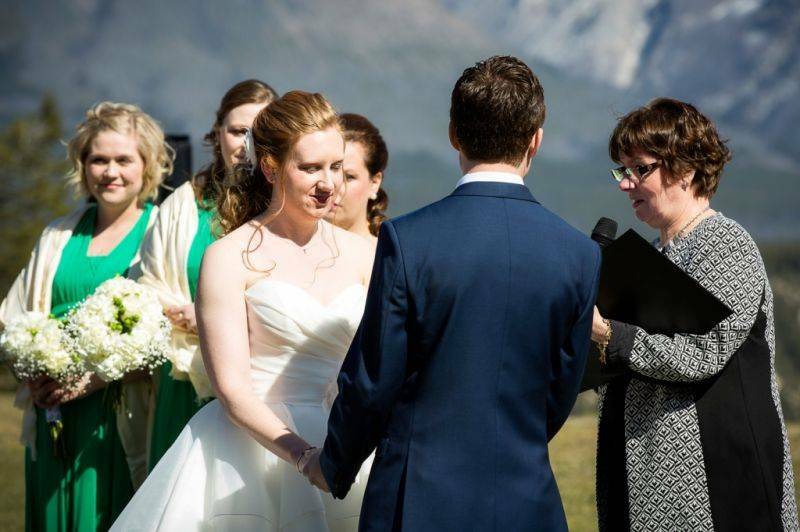 The Banff wedding reception was held at the beautiful and rustic Buffalo Mountain Lodge. 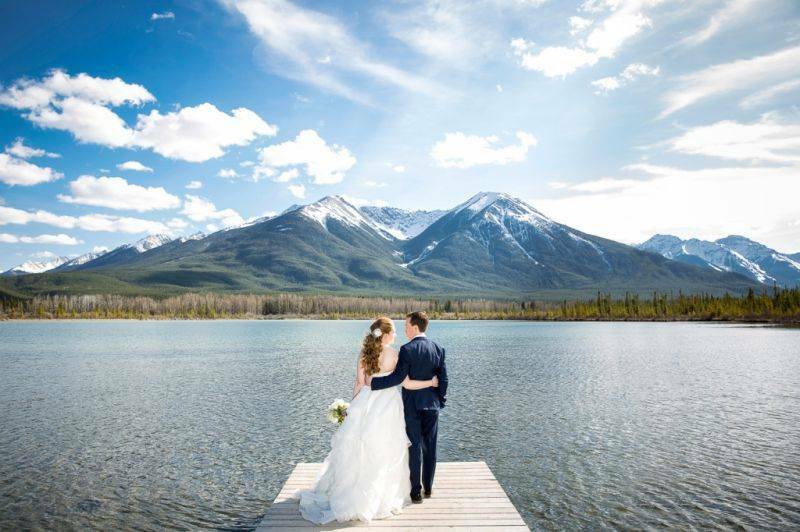 As soon as Claire and Scott walked into the venue they knew it was absolutely perfect for them, the rustic log cabin with river rock fireplace and stunning views of Cascade Mountain took their breath away and they booked it immediately, cancelling all other appointments. 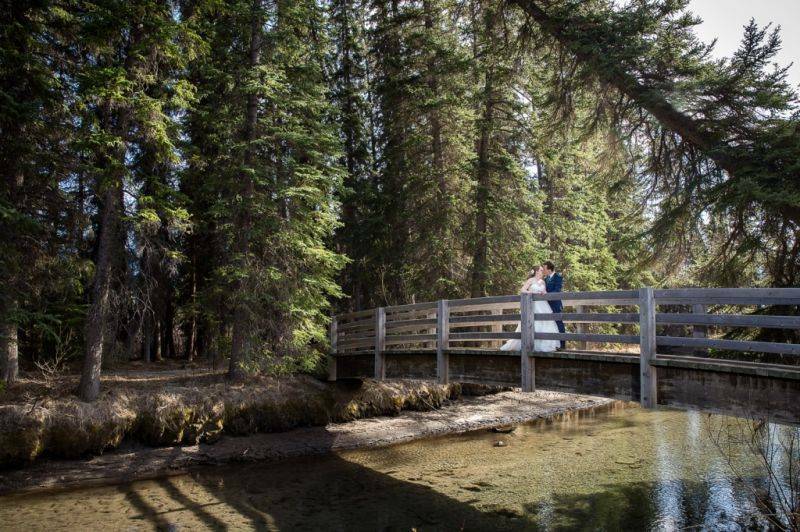 A huge thank you to Banff wedding photographer, Kim Payant for sharing these beautiful photos with us today. 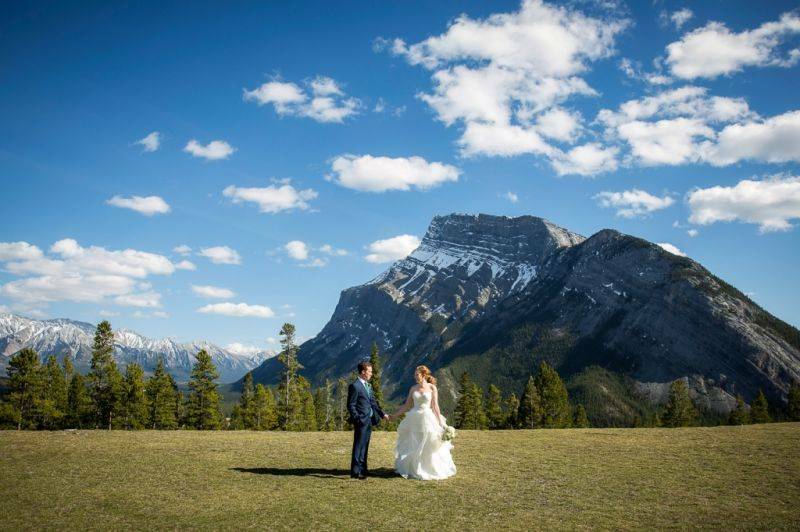 Kim is a member of our mountain vendor directory and an amazing photographer located in Banff. 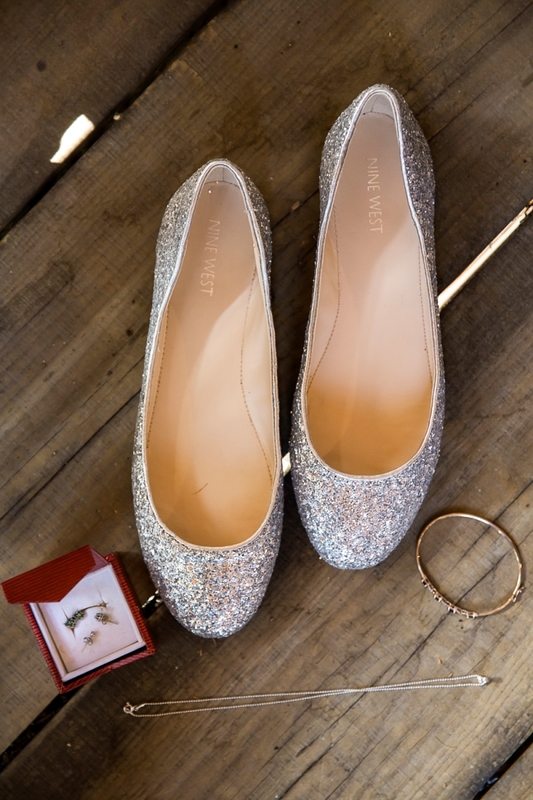 Her photos have graced the pages of many managazines and blogs around the world and we always love seeing her incredible work.